Why The Democrats' Koch Brothers Fixation? : It's All Politics Democrats are painting Republican senatorial candidates as stalking horses for the billionaire Koch brothers. Republicans say Democrats are desperate. Democrats say they're focused on the Koch brothers because, they allege, Republican candidates are doing the billionaires' bidding. Republicans say Democrats are desperate. 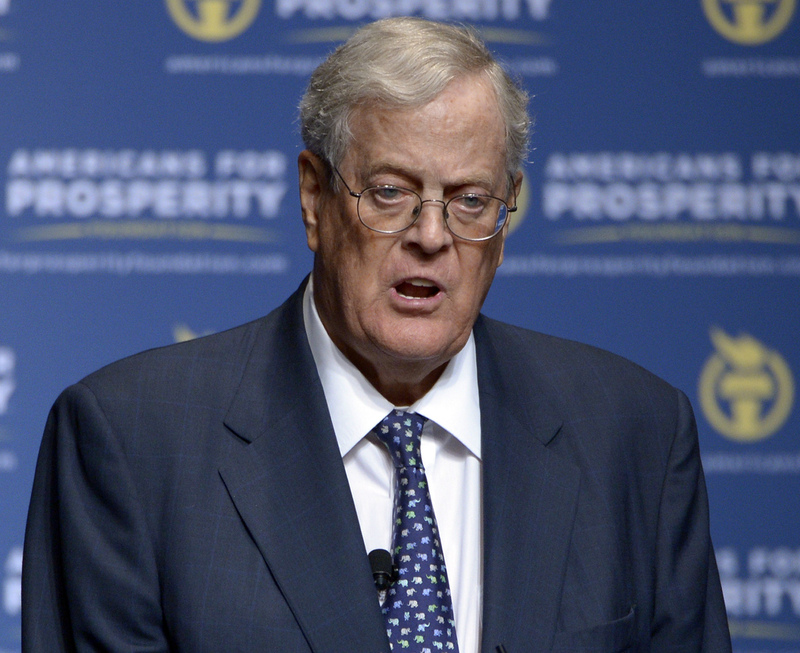 David Koch (above) is chairman of Americans for Prosperity. Another day, another wave of Democratic attacks on the Koch brothers and their Republican allies. Sen. Harry Reid, the Democratic majority leader, took to the Senate floor Monday to bash the Koch brothers and the GOP, as has become his habit in recent weeks. In his latest criticism, he accused Republicans of stalling aid to beleaguered Ukraine until Democrats agreed to delay new Internal Revenue Service rules that would affect the political activities of nonprofit groups. "Republicans delayed this aid package for 10 days in order to protect the Koch brothers and billionaires just like them," Reid said. Reid didn't cite the nonprofit, Koch-brothers-funded group Americans for Prosperity, but that's what he meant. Another Democratic attack on Charles and David Koch came from a different direction. American Bridge 21st Century, the opposition research group, weighed in with a new Web ad that accused AFP and the Kochs of misleading voters via untrue attacks on vulnerable Senate Democrats up for re-election. That ad followed news that another independent Democratic group intends to spend $3 million on anti-Koch ads in the several states where Democrats are thought to be most at risk. Why do Democrats seem to be so fixated on the Koch brothers? First, the Koch brothers are arguably good for fundraising. Dave Weigel of Salon reported that Democratic email pitches that mentioned the Koch brothers generated more donations than those that didn't. But Democrats said it wasn't really about the Kochs being good for Democratic fundraising pitches (though there's nothing wrong with that). The additional amounts raised are trivial compared with the estimated $30 million AFP has already spent, they said. Instead, it's about defining Republican opponents of Democratic Senate candidates as essentially being stalking horses for the billionaire brothers. "While most voters may not know who the Koch brothers are, they all know who out-of-state, very wealthy special interests are," said Justin Barasky, a spokesman for the Democratic Senatorial Campaign Committee. "Everyone knows there are people who have it easier who are trying to game the system. ... It's about holding Republican Senate candidates accountable in a believable way." The Republican take on what's happening is, of course, decidedly different. "The signs are that Harry Reid is on the verge of losing his mind now that he's on the verge of losing his majority," said Brad Dayspring, a spokesman for the National Republican Senatorial Committee. "And American Bridge, it's quite something to see them attacking special interest money when George Soros funds their entire operation," Dayspring said. "Their attacks are laughable; they have to motivate their base in a year when they seem primed to sustain major electoral losses." Actually, the explanations aren't necessarily mutually exclusive. All of them could actually explain why Democrats will try to keep the Koch theme going through Election Day.